Dr. Jeffrey Lee uses Cone Beam CT (CBCT) scanning technology to create treatment plans for dental implant cases. 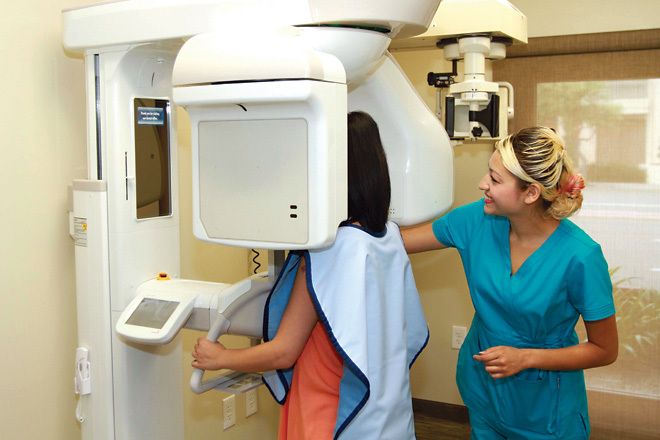 Our Pax Duo3D Cone Beam imaging system provides CT scans, or 3D X-rays, and panoramic X-rays. It is used to get 3D and panoramic views of the jaw and head area for precise planning of implant placement. It provides clear 3D images of the bones, nerves, blood vessels, gums and other soft tissues. This type of imaging system is commonly referred to as a Cone Beam CT (CBCT) and is basically a CAT scan. It acquires images of the head area through a rotating X-ray. However, a Cone Beam CT is a compact, faster and safer version of a regular CT, using far less radiation. The time needed for a full scan is generally under one minute with a radiation dosage of about one hundred times less than a regular CT scanner. The use of this ultramodern technology has taken implant dentistry to another level. The Orange County Implant Center is proud to be one of the few dental offices with this leading-edge equipment. To schedule an appointment, call 714.734.9363 or click here to schedule online. “As a result of Dr. Lee’s experience, I no longer have to worry about saving my teeth and, more importantly, he is saving my life." Serving all of Orange County, including Aliso Viejo, Anaheim, Anaheim Hills, Brea, Buena Park, Costa Mesa, Cypress, Dana Point, Fountain Valley, Fullerton, Garden Grove, Huntington Beach, La Habra, Laguna Niguel, Laguna Hills, Lake Forest, Los Alamitos, Irvine, Mission Viejo, Newport Beach, Orange, Placentia, Rancho Santa Margarita, Santa Ana, Stanton, Tustin, Villa Park, Westminster and Yorba Linda.